Born in Reading, PA in 1958, “Mark James” Leister has been entertaining since the age of 8 when his mother would stand him up on a chair to tell jokes at dinner parties. Throughout his school years he was involved in many different public productions spanning both live events and local television, but it wasn’t until the eleventh grade when he discovered music as his chosen vocation. Shortly after high school, Mark was playing guitar on the carnival circuit with Sonny Miller and the Happy Valley Boys. In 1982, he went full time on the road with bands produced by Bobby Mercer. First with Midnight Magic, then on to Johnny L and Sax Appeal, by 1985, Mark “graduated” to the Bobby Mercer Road Show, expanding his musical experience to include bass, trumpet and flugel horn. The years spent with Bobby Mercer included Las Vegas style performances in both the six piece show band and the sixteen piece big band to audiences from 300 to 15,000, sharing the stage with such artists as Lee Greenwood, Marie Osmond, Reba MacIntire and the Four Tops. 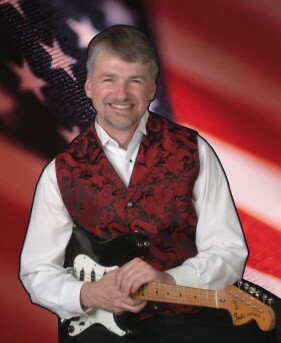 In 1989, Mark James pursued a solo career as guitarist/vocalist/producer and continued to perform from “New York to LA and Toronto to Key West.” Mark participated in the college circuit starting in 1993, which included not only concerts, but educational seminars regarding the use of computers in both the music business as a “business partner” and as a live “band” on stage. After involvement with professional corporate and music video production Mark started his company, MicroChip Music, to bridge the gap between musicians and computers, setting up systems for both musicians and consumers to enjoy and create music with their laptops or desktops. By 2004, in addition to managing his business, Mark maintained a playing schedule performing solo, as well as occasional band projects as a "hired gun guitarist" with First Class, Radio Daze and Buchafunk out of Reading, PA. His favorite role is performing music in the schools with Craig Wes Fisher's "PA Educational Music In The Schools". The program is called "Having Fun With Music", and features each of the 8 players with music and a message about the part music has played in their lives. Mark sees this as an opportunity to “pass along” the experience of music to a new generation and to encourage young people to “do what they love” to achieve their own unique goals in life. In 2005, Mark made the transition back into music as his primary vocation. He was offered the lead guitar position with long time friend, singer and excellent songwriter John Frinzi and his band. That opportunity included numerous performances with Doyle Grisham, Michael Utley and Robert Greenidge (members of Jimmy Buffett's Coral Reefer Band), most notably at the 2005 Meeting Of The Minds Street Festival in Key West, Florida. Playing at this level kicked the guitar chops up a notch providing the platform to apply his skills to John's original material. This has been regarded as a pivotal turning point in Mark's musical carreer. John Frinzi is now living in Florida and Mark plays with him whenever their two schedules can intersect. MicroChip Music continues to thrive providing live event sound reinforcement and production, website development, A/V production and computer technical support & consulting when Mark is not on tour. Having Fun With Music continues to circulate through Pennsylvania on funding from the state during the school year. Regardless of whether Mark James is performing by himself or touring with a band, whether he is behind the scenes running a MicroChip Music production, or in the studio producing and playing for another artist, he truly loves what he is doing and delivers a warm, personable and fun feeling to anyone involved. You can find more information about Mark James and his music at www.mark-james.com - the business website is www.microchipmusic.com and information about the music in the schools is at schools.microchipmusic.com - make sure to drop a line and say hello!